Damaged circular formation on the SE slope of Maurolycus. 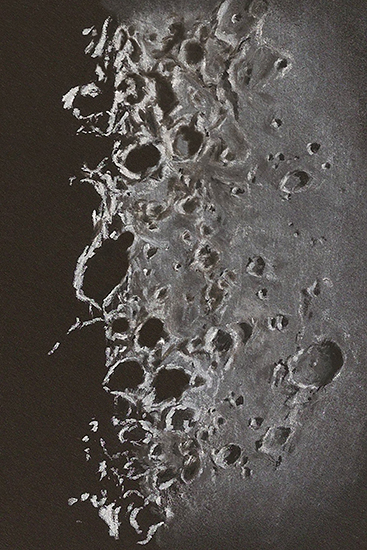 The Moon’s southern terrain used to intimidate me, but these days I welcome the challenge to sketch larger sections of it during my observing session. Drawing highlights rather than shadows saves time. This is especially true along the terminator, since using black paper means that the shadowed area of the Moon is already completed for you! 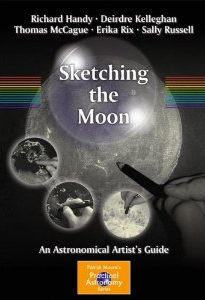 If you want to tackle large, complex areas while lunar sketching, make sure to increase your drawing area. If it’s too small, you’ll have a difficult time filling in the details with a sharp stroke. My sketch area was a little smaller than normal and it’s painfully obvious by the soft, blunt appearance of the final sketch. Eyepiece sketch on black Strathmore Artagain paper, white Conte’ crayon and pastel pencil, black and white charcoal pencils. Sketch has been flipped so that north is up, west is to the left. ~ by Erika Rix on June 15, 2014. I always wondered about that… Why the drawing would be so much larger than the image. Not having taken any art classes ever, and being surely deficient in visual art talents, I must rely on skill-building to improve at sketching. How does one estimate how large the drawing should be? Perhaps it’s just a matter of experience? While I do see what you mean by the softness, it gives it an artsiness that is attractive. 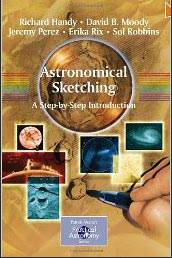 I am hoping that as I learn more about astronomical sketching, I will both improve in accuracy and artistic ability. I want my sketches to give the observer the feeling that I get when I look through the eye piece… And I think that is going to take something more than just accuracy. The moon was exquisite the last time I attended a star party. I wanted to reproduce that so much! It was sugary white on blue… It really inspired me. Have you ever tried to sketch one like that? Hi Esther. It’s good hearing from you. I judge the sketch size by a few factors. 1) complex area with vast details requiring more space v/s simplistic areas, 2) sketch media being used, pastels and charcoals require more sketch area than sharp graphite pencils, 3) what is the sketch intended for other than an observation record? Will it be framed, commissioned or laminated and stashed in my observing folders after scanning? If it’s a complex area, you may have difficulty making a clean, crisp sketch with accuracy. In fact, you might not be able to add all the details because of the lack of space. If you find that happening early in the session, it might be worth starting the sketch over and this time doubling its size. If you don’t want to start over, consider it a learning experience and make a larger sketch next time. Outstanding sketch Erika, it leaves me breathless in it scope and beauty.